While the pressures on large organizations to use social media have gone up, creating a social media presence has reached one-click simplicity. The result is a sprawling mess. Take one look at the social media footprint of any large brand and you find dozens of social sites that lie abandoned with no active engagement. Many are redundant, fracturing the same potential audience into separate, so-called “communities.” And the bigger the organization, the bigger the problem. In one recent project, my company found our client had close to 150 Facebook pages, more than 65 YouTube channels and 100 Twitter feeds. 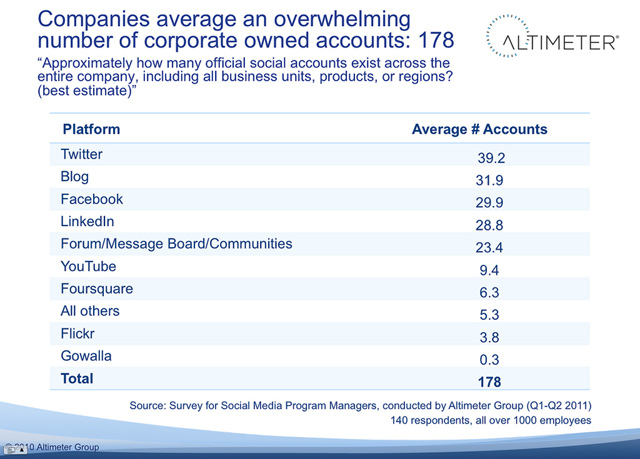 Recent data from the Altimeter Group confirms the issue, with the average organization maintaining 178 social accounts. This is unsustainable and counterproductive. The solution is a “social media architecture” — a structure that brings harmony, utility and durability to the diverse elements of an organization’s social media presence. Here’s how to build it. A proper footprint uses a few data points (site name, platform, size, recency of moderator activity) to visualize your social media presence. Below is a generic example of an organization’s social media footprint on Facebook. The graphic below shows community (by page name), size (by size of dot) and recency of moderation (green is recent, yellow is not very recent and red is inactive). 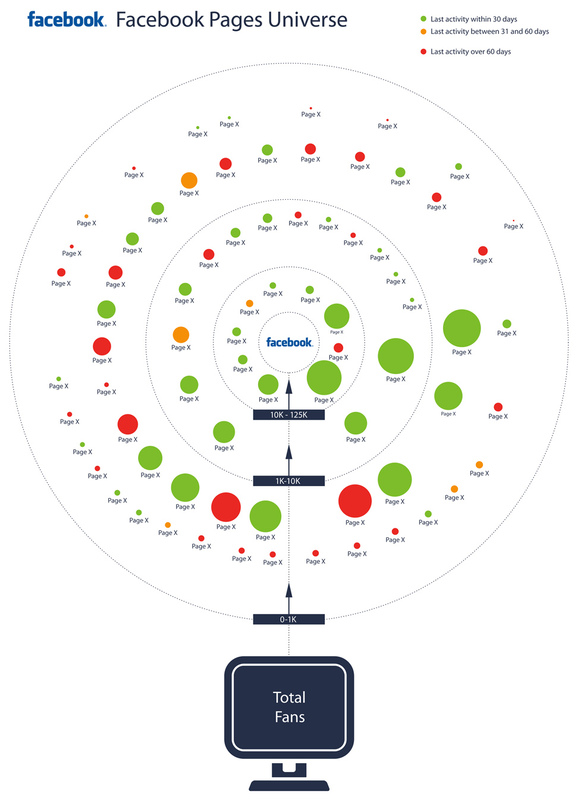 Click to enlarge Without diving into details, big green dots at the center are good, indicating larger communities with active client moderation. Red dots anywhere (no moderation activity in 60 days) are bad. Immediately, this allows the organization to begin having serious discussions that no Excel sheet will provoke. Any spread of red dots creates a conversation: Are we abandoning our customers with on/off campaigns? Are we fragmenting the same communities across multiple resource-intensive efforts? Are there big green dots in the center that can represent best practices or serve as great places for valuable content from other parts of the organization? Are there any patterns to the successful sites? Visualization is the first step in recognizing you have a problem. The social web is driven by groups of like-minded people gathering together to connect and share information — “communities,” as they are commonly known. Whenever a company assumes its own organizational structure is the defining logic for what constitutes a community, you see the problem right away. Every product line warrants a Facebook page, every marketing campaign deserves a Twitter account, a new YouTube channel and so on. As a result, an organization’s social media presence becomes a mirror into the structural divisions of the organization itself. What warrants creating a new social account? What minimum resource commitments are required to service a social account? What are the criteria that will govern closure of a social media account? The effectiveness of your checklist will be derived from adhering to the principles above and developing it in a spirit of cooperation within your organization. No one appreciates being handed a checklist and told that this is his new measure. Employees will be much more willing to own a checklist when they see it as a result of fair process and their valued input. Cross functional workshops are a great way to get this done. If you put these three questions above into a structured conversation, you might be amazed at the agreements (and the checklist items) that come out of the discussion. Envision the social web, with its constellation of sites and platforms, as one distributed website (albeit a more dynamic one), where your brand is spread across a vast, disconnected set of pages. Establishing your link and like structure is a basic exercise in information architecture that defines how people will navigate (link) to find the communities where they belong (like). A proper link and like structure formalizes the purpose of each property (the community you are serving, the audience needs you are addressing, and content you are producing) and its relationship to other properties (i.e. how content will flow between sites). A proper link and like structure allows your organization to make the most of its content — repurposing it across formats (text, video, tweets, etc.) to optimize its utility and lower your operating costs. The decentralized nature of social media is its greatest strength. Anyone can participate. Everyone has a voice. This is also the greatest challenge for brands that must manage the inherent conflict between empowering their own organization to participate while still maintaining continuity and quality of customer experience. The current sprawl represents a great waste of energy and resources. As organizations continue to invest in social media, and the market continues to demand a “social media strategy” articulated in every board room and annual report, the terms of success will move from isolated pages and campaigns to connectedness and coordination. For that, we need social media architecture.